Hey folks! It's so good to be back here and I'm really excited to be sharing this card today. I posted this to my Instagram account a while back and had a really positive response (thank you!). 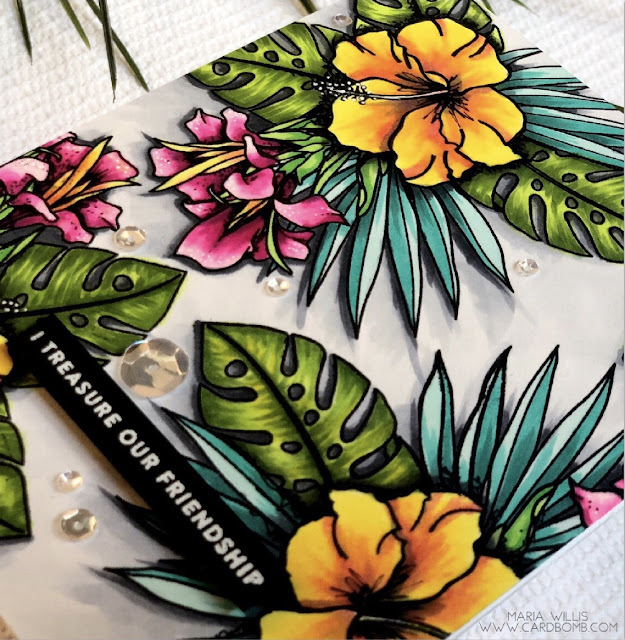 I'm happy to finally be sharing it here on my blog because so many people had questions about the which stamp I used, what colors of Copic Markers I used and how did I do the coloring. I'll start by saying that I am actually pretty new to Copic coloring and I don't have as much time to practice as I wish I did. This card took me multiple sit downs over many days because it's rare for me to have the time to sit and finish something like this all at once (yes, it took me hours to finish but it was fun). 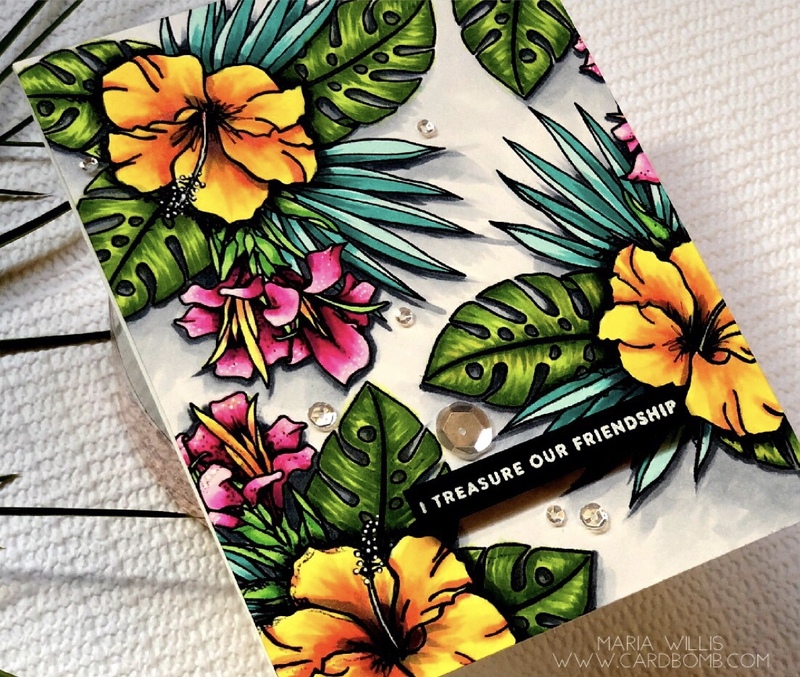 I used the WPlus9 Hibiscus Bouquet Stamp set and stamped it multiple times on my cardstock in a Copic friendly ink. I started out coloring the yellow flowers. I think I did that because they are the easiest part of the image and they are in the "front" of the image. I moved on to the green leaves, the pink flowers and finally finished with the long blue leaves. I'll share all of the Copic Marker colors that I used at the bottom of the post. I colored the whole background light gray. The cool gray markers seem to be the ones I reach for most and they are the markers that create the most drama on this card. If you look closely you can see that I've used gray markers for some additional shading where I didn't achieve the depth and dimension I had hoped for with my original color choices. This is a great trick if you're looking to add some shadows but are worried about picking the wrong color to do it with. I also used the grays to add some drop shadows. I used lighter grays to add depth and I used a slash of the darker gray (maybe a C7? I'm so sorry that I didn't take note of which grays I used) under the leaves to make them look like they are popping off of the page. I love this tiny sentiment from Simon Says Stamps. I was looking for a small sentiment because I didn't want to cover up much of my background. I also wanted something meaningful because I was mailing this off to a friend who I both treasure and miss. 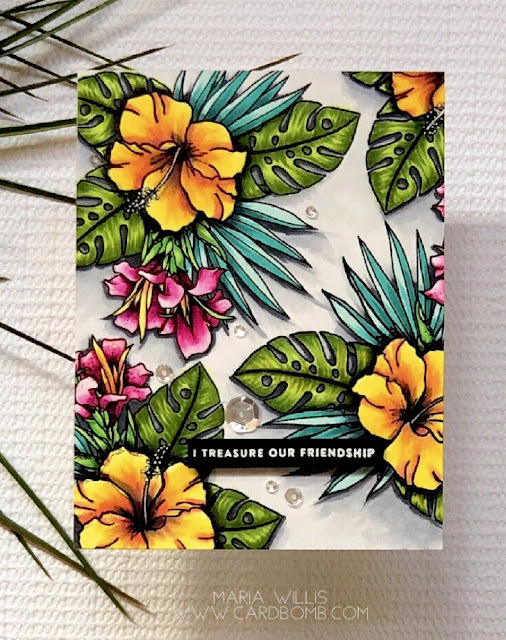 I heat embossed the sentiment in white on black and it was perfect for this card. I added some clear sequins in different sizes and that was it! Wait! Actually that was not it! I used both a black sharpie and a white gel pen on this card. I used the sharpie to get even more depth in the really dark parts of the design. I used the gel pen on the stamen and to add some highlights to the pink flower petals. Don't forget that if you're trying this yourself. These little details can make a big difference! Alright! That's it for today folks. I hope you have some fun coloring something up on your own and I will see you back here soon! Hahaha! Thanks Sandi! Yes, you need this stamp! You will make amazing things with it. Thank you Paula! I’ve been working on trying to get dimension with my coloring. SO BEAUTIFUL! I love all the shading, and the honesty about how long it takes to color a full panel like this. I hope the recipient is someone who will keep and treasure this card! Thank you Becca! I appreciate your kind words. Yes, I sent this off to a friend who is also a card maker. She won’t throw it in the garbage, thank goodness!